To celebrate the leap year, we offered you the chance to win a dream wedding worth up to £20,000. All you ladies had to do was to take the leap of faith and propose to your men…live on air! We’re now delighted to lift the veil on the winning couple – Ceri and Paul! We had so many great entries, and we’d like to say a huge congratulations to the three finalists who each did a fantastic job at surprising their partners and pulling off the perfect proposal. It’s certainly been a leap year to remember and we wish each of the happy couples all the best in the future. For those who missed it, here’s a look back at the unforgettable moment when Ceri proposed to Paul; this is one love story you won’t want to miss. Paul O’Dwyer is an ex-military man with a heart of gold; he’s also one half of Swansea’s Trampface. After finding out that 30% of homeless people in Wales were ex-service people, Paul and his friend Lee decided to do something noteworthy and meaningful to raise awareness and funds for two charities, Shelter and SSAFA, and thus, Trampface was born. Paul and Lee initially spent 7 days posing as homeless people on the streets of Swansea to raise money for the two charities. After raising over £5,000 in the first year, Paul and Lee now pull off different stunts each year. You can stay up-to-date with Trampface’s charity work on Facebook. Paul was called into The Wave radio station under the pretence of an interview regarding his charity work for Trampface. Little did he know that his blushing bride-to-be was waiting in the wings to give him the surprise of a lifetime. 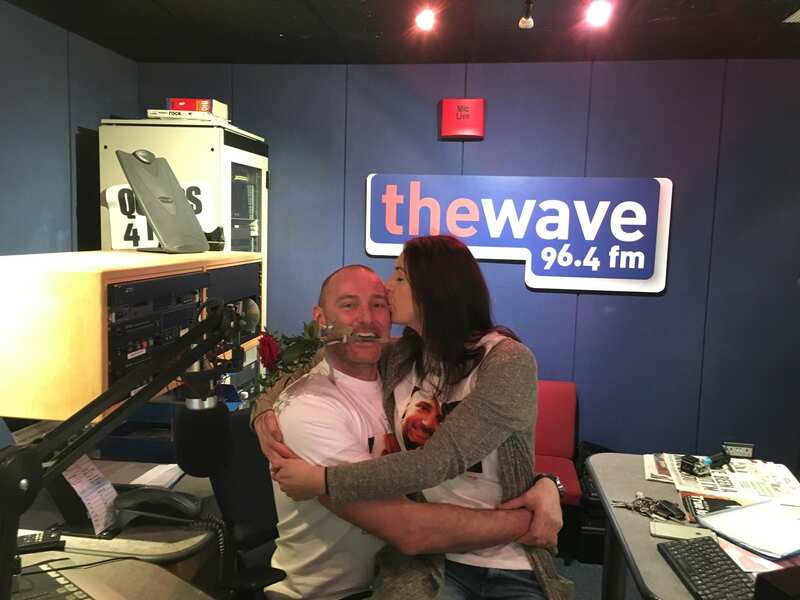 Listeners tuned in on Valentine’s Day morning to hear all about the incredible charity stunts that Paul and his friend, Lee, have undertaken to raise thousands of pounds for charity. 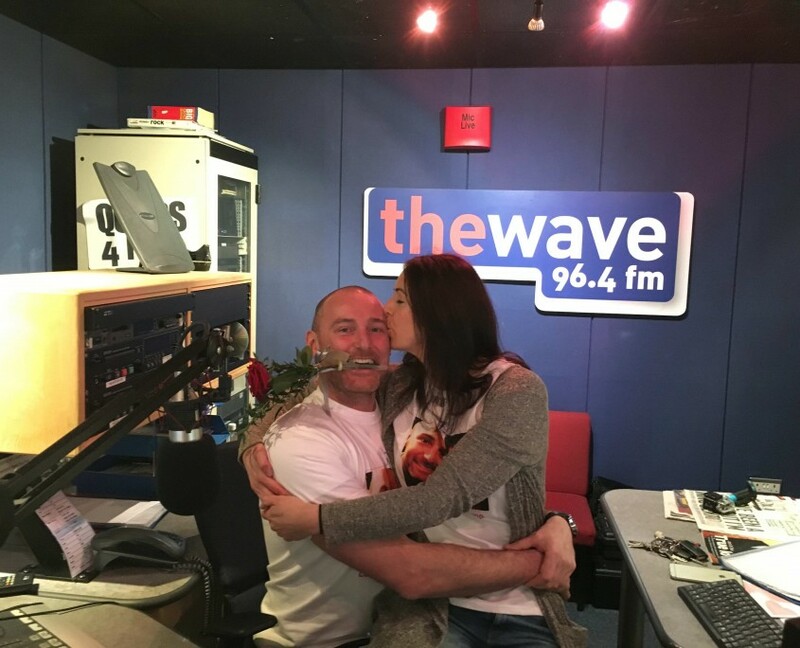 After the first part of the interview was over, Ceri came out to surprise Paul live on air with her moving and heartfelt proposal, complete with a rose and t-shirts customised with the couple’s photograph! Ceri kept her speech short and sweet, but packed with sentiment. 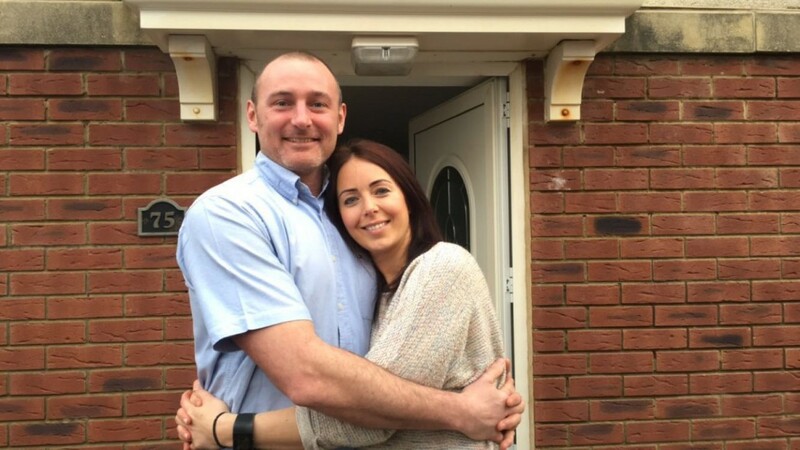 Congratulations Ceri and Paul, we look forward to sharing your special day on Thursday 14th April 2016!